Renault-Nissan CEO Carlos Ghosn remains confident that by 2018 his alliance will rank as one of the world's three largest automakers. He sees the alliance rising from its current No. 4 ranking, even though last year it encountered big troubles in Russia and finished about 1.4 million vehicle sales behind No. 3 General Motors. 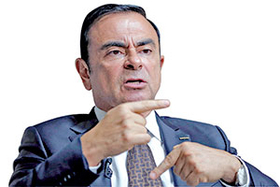 During an interview with Automotive News Europe Editor Luca Ciferri, Ghosn, 60, also shared his views on retirement, the sales race and the challenge of hitting a combined 10 percent share for Nissan and Infiniti in the United States. Q: Will economic downturns in markets such as Russia prevent Renault-Nissan from becoming one of the three largest automakers by 2018? A: In the short term, some of the emerging markets where we have significant capacity such as Russia are not moving in the right direction, but this will not last forever. When oil prices return to a more reasonable level -- because today they are abnormally low -- the Russian market will boom again. Russia falls very quickly but also recovers very rapidly. Do you still believe the alliance will make it into the top three in three years? Yes, I'm optimistic that the numbers will rise. We have headwinds in some markets, but we sold 8.5 million units last year. The No. 3 [GM] is 1.4 million units ahead of us, but in this industry, a lot of things can happen in three years. Does the alliance need another partner to enter the top three? We don't need another partner. Partnerships are a matter of opportunity, synergies and complementarity. You don't form partnerships just for the sake of additional volume. Scale is a problem, sure, but at 8.5 million units, we don't lack scale. Somebody else needs to worry about scale, not us. What is the outlook for Europe? Europe is not growing; it is recovering. There's a big difference. The European market is still about 20 percent below its 2007 peak. I think the current situation is healthy, and this slow recovery will continue in the coming years. The U.S. recovery is finished, and we are on a new growth path. I don't think the U.S. market has peaked yet. We will see moderate growth continuing -- probably not 5 percent year over year, but 2 to 3 percent, which is fine. How important is reaching a 10 percent U.S. market share? The 10 percent that I set up for the United States is in the cards. It's planned. It's going to be delivered. So I'm not worried about it because I think our U.S. team has proven it is capable to carry this kind of objective, execute with discipline, and deliver. And it's a question of time. Certainly before the end of the Power 88 plan, which should be measured by fiscal year 2016, which is March 2017, we'll be there. We'll be at more than 10 percent in the United States, which is something we should have achieved already in the past, but the fact that we are about to achieve it in a way which is sustainable, it's not a question of making a firework on the peak of a product renewal. No, it's a stable, sustainable 10 percent market share in the United States. I don't worry about it. But it's a basic condition for [being in the top three globally], as much as a strong performance in China is a basic condition for this. China will continue to grow, but the pace is moderating, which is normal. I do not envisage any risk of a bubble. There may be some excesses here or there, but nothing major is threatening the car industry in China. Is the alliance reducing suppliers? Every time we can reduce the number of suppliers, we do it. However, reducing the number of suppliers risks reducing competition. Therefore, you need to make sure that the guys who are supplying you become your partners. If not, you will find yourself in a very uncomfortable position: not having a big choice [of companies to work with] and not having long-term relationships. Do you have a problem when a supplier's margins are substantially higher than yours? No. I'm worried when a supplier has a much lower margin than mine because he may not be interested in doing business with me. Also, when you come to ask him for competitiveness, he will tell you: "I don't make enough money." When your suppliers make more money than you, it puts you at ease to have a very balanced relationship. You plan to retire before the end of the decade. You have said you would not recommend that one person runs both Renault and Nissan in the future. Has your opinion changed? No. I don't wish this on anyone. I'm doing it because of circumstances. That's why I don't think it would be fair to repeat something like this. I'm not going to speculate on this because this is not a pressing matter. I have a new mandate with Renault that runs until 2018, so we have still 31/2 years to go. Is 65 the right age to retire? Retiring at 65 is mandatory at Renault. The issue came before the board, and I voted in favor of this. Like most Japanese companies, Nissan does not have an age limit. In every country we operate, we follow the local rules. Those CEOs who think that they are still young and fresh enough to do the job at 65 can go and negotiate with their boards. I personally think that 65 is a very reasonable time for a CEO to step down. How important is autonomous driving? Renault-Nissan wants to be at the forefront of autonomous driving, which means empowering people in the car, giving them the possibility to drive or not to drive. It's about re-establishing the pleasure of driving. What pleasure is there in keeping your eyes on the road and your hands on the wheel during a traffic jam? At the same time we are not interested in driverless cars. That is a completely different story. When will the investments in autonomous driving start paying off? Autonomous driving comes from modules, and we are already installing some of them in our cars, such as automatic parking, lane keeping and steer-by-wire. These and other pieces of technology are coming one after the other, so they are being amortized one by one. I would say that autonomous driving is a much easier technology to amortize than electric cars or fuel cells. Is low-price oil making plug-in hybrids more attractive than EVs? Five years ago we were the only automaker with pure EVs. Now we have followers such as BMW, Mitsubishi, Volkswagen, and others are coming, so we don't feel lonely. In addition, it is not either EV or plug-in hybrid because a plug-in is an EV with a small engine to extend its range. I'm still convinced that EVs are going to be a big part of the future. Do EVs eliminate other technologies? Not at all. We will continue to have plug-in hybrids, hybrids and fuel cells, but EVs are going to cover a much bigger percentage of the car market than what we see today. Does the weak euro help or hurt Renault-Nissan? A weak euro is good news for all carmakers building cars in Europe because most of the players have overcapacity in the region, and Europe is a net exporter of vehicles. The same happened to Japanese carmakers when the yen declined against the dollar and the euro: It was good news for everyone.